Defending champion Bishop Carroll perhaps wasn’t supposed to be sitting atop Class 5A this late in the season after graduating 35 seniors off of last year’s team. The Golden Eagles started off strong in posting dominant wins over Wichita Heights, Wichita North, and Wichita South. But the next two weeks, Carroll looked anything but the top-ranked team. The Eagles trailed an improved Wichita West program 10-0 before rallying in the second half to win 20-10. They then needed a fourth-quarter touchdown and a late fourth-down stop to beat Wichita Northwest 12-7. They rebounded last week behind junior quarterback Colton Howell who had a hand in five touchdowns, and senior back Tory Smith who rushed for 168 yards in a convincing 42-10 win over Kapaun Mt. Carmel. Can Carroll repeat in 5A? There are currently three other teams boasting 6-0 records, but few people around the state would have Andover, Mill Valley, or Andover on their list of elite 5A contenders. Salina South may be Bishop Carroll’s biggest challenger in getting back to the title game. The Cougars have stumbled against Maize and Blue Valley, but have a win over 6A’s top-ranked Derby. South must first get through a tough district that includes Hays (5-1), Great Bend (4-2), and their cross-town rival Salina Central. Topeka West (2-4) – After opening the season with victories over KC Schlagle and KC Washington, the Chargers have lost four consecutive Centennial League games. The Chargers have allowed at least 48 points in each of their league games. Topeka West has won only three games dating back to the 2010 season. Quarterback Joshua Reynolds has more than 1,000 yards of total offense for the Chargers this season. Shawnee Heights (1-5) – The T-Birds’ only victory was against nonconference opponent KC Schlagle. Shawnee Heights enters district on a four-game losing streak, but it has been competitive in each game. Quarterback Taymon Grabauskas has passed for more than 1,100 yards. Shawnee Heights has made the playoffs every year since 2005. Topeka Seaman (1-5) – The Vikings earned a 21-20 win over Junction City in Week 2, but have lost four consecutive games since then. Quarterback Ryan Chaffee has completed 47 of 79 passes for 610 yards. Seaman fell in the first round of the playoffs last year. Topeka Highland Park (0-6) – The Scots have lost their six games by a combined score of 327-34. They have allowed more points than any other team in 5A and have scored the fewest. Quarterback Kameron Clark has led the Scots with 728 yards of total offense. Key Games: (Week 9) Shawnee Heights faces Topeka Seaman in a game that is sure to have playoff implications. Mill Valley (6-0) – The Jaguars opened the season with an impressive victory over 6A’s Manhattan and have remained unblemished since then. The Jaguars have used both Ty Bruce and Logan Koch at quarterback. Mill Valley has advanced to the postseason in each of the past five seasons but hasn’t made it past the first round since 2008. KC Washington (4-2) – The Wildcats have won four straight since losing the first two games to Blue Valley Southwest and Topeka West. Junior running back Jaevon Williams leads the Wildcats’ offensive attack with 858 yards and seven touchdowns. KC Washington is trying to snap a long postseason drought. KC Schlagle (3-3) – The Stallions have scored no more than 24 points in a game this season, but have allowed no more than 29. They are getting good pressure on the quarterback with Rodney McNeal and Phillip Randle leading the team with five sacks each. Schlagle is attempting to make the playoffs for the first time since 2009. Lansing (3-3) – The Lions boast a strong offensive attack, scoring at least 34 points in each game. However, they are allowing 39.6 points per game. Quarterback Krystian Abbott has passed for more than 1,800 yards. Wide receiver Khalil Bailey has 37 catches for 970 yards and 13 touchdowns. Lansing has advanced to the first round of the playoffs in each of the past three seasons. Key Games: (Week 7) Lansing travels to face KC Washington. Bishop Miege (5-1) – The 5A state runners-up from a season ago had a question mark at quarterback entering the season, but junior Ryan Willis has been exceptional. Willis has thrown for 1,752 yards and 18 touchdowns in only five games. He missed last week’s 21-19 win over Blue Valley West with a concussion. He has weapons at wide receiver in McKinley Johnson (655 yards, 8TD) and Michael Murphy (545 yards, 8TD). St. Thomas Aquinas (1-5) – Aquinas has just one win, but they have the weapons to make some noise in this district. Danton Cosentino has passed for 1,169 yards and eight scores. Ryan McNellis is a combination of size and speed at wide receiver has 46 recpetions for 669 yards and eight touchdowns. Joel Edwards leads the Saints in rushing with nearly 500 yards and six scores. KC Turner (1-5) – Turner’s only win came against Bishop Ward in Week 4. While the offense has produced some points this season behind quarterback Paul Berry, the defense has given up nearly 40 points per game. KC Harmon (0-6) – The Harmon Hawks have struggled to score points this season. Harmon has been shut out twice and scored only six points in three more games. The Hawks have currently lost 18 straight games. Key Games: (Week 9) Miege at Aquinas will decide both playoff spots. Pittsburg (6-0) – The Purple Dragons enter district competition with an impressive 6-0 record, but they have struggled against the Kansas City-area schools recently. Despite being one of the top teams in the Southeast Kansas League each year, Pittsburg has won only three district games since 2008. However, the Dragons may have their best opportunity to break through in recent years. Running back Alex Barnes has rushed for more than 180 yards per game. Blue Valley (4-2) – The Tigers’ two losses come to quality teams in Class 5A’s second-ranked Bishop Miege and Blue Valley Northwest. They also opened the season with a 28-0 victory over 6A’s fifth-ranked Gardner-Edgerton Trailblazers. In Blue Valley’s recent 35-3 win against St. Thomas Aquinas, Montana Brady rushed for 140 yards and two touchdowns on 21 carries. Blue Valley Southwest (3-3) – Playing in the competitive Eastern Kansas League, the Timberwolves have fallen to Bishop Miege, Blue Valley Northwest and Gardner-Edgerton. Those three teams combine for only four losses. Quarterback Drake Herrman passed for 113 yards during last week’s loss to Blue Valley Northwest. After making the playoffs both years in 4A, the Timberwolves are attempting to make their first 5A postseason appearance. Blue Valley West (3-3) – Just like the Timberwolves, the Jaguars’ losses come to quality teams in Bishop Miege, Gardner-Edgerton and Blue Valley Northwest. They lost the three games by a combined deficit of 12 points. Quarterback Ryan Ralston passed for 141 yards and a touchdown in a 27-24 loss to 6A’s fifth-ranked Gardner-Edgerton. The Jaguars advanced to the second round of the playoffs in 2012. Key Games: Every game will be extremely important in a district filled with quality teams. Andover (6-0) – The Trojans are now 14-3 the last two seasons after it finished 3-15 in the two years before 2012. The Trojans have outscored opponents 166-64 and posted two shutouts. Last week, Andover allowed a season-high in points in a 36-25 win against Goddard. Andover ranks fourth in Class 5A in scoring defense. Emporia (3-3) – After a 9-2 season last year that featured Oklahoma State commit Jerel Morrow and all-state wideout J.L. Savage, the Spartans have dropped back under first-year coach P.J. Marstall. The Spartans lost starting quarterback Braxton Marstall to a broken collarbone early in the season. Emporia has outscored teams 181-83 and ranks sixth in scoring defense. Emporia lost at Manhattan 6-3 in Week 2 and fell the last two weeks to Hayden (36-19) and at Topeka (21-17). Newton (3-3) – Newton has played in several high-flying contests and has a collective score of 192-187. The Railers are 2-0 at home and 1-3 on the road. Newton lost at Salina Central 49-35 in Week 2 and then lost at Hutchinson 56-32 in Week 4. Valley Center (0-5) – Valley Center has struggled throughout the year and tallied just 46 points, third-fewest in the classification. The Hornets did lose to Goddard 14-10 in Week 2 and 13-12 at Arkansas City in Week 4. Kapaun Mt. Carmel (5-1) – Kapaun opened 5-0, but lost the City League title to Bishop Carroll in a 42-10 defeat last Friday. Kapaun had three first half turnovers and hasn’t defeated Carroll since 1999. Quarterback Brock Monty paces the Kapaun offense, but finished 10 of 22 for 245 yards and three interceptions and a TD pass. Monty has passed for 602 yards, rushed for 313 yards and accounted for 11 scores. Kapaun has already exceeded last season’s win total from a 3-6 campaign. Wichita West (4-2) – Veteran coach Weston Schartz has already delivered a massive transformation with the Pioneers, one of the state’s longtime struggling programs. Prior to this season, West had never won more than three games in a season in the last decade. West has outscored opponents 177-120 and could have its first playoff appearance since 2002 and just seventh in school history. Schartz, No. 2 all-time in the City League for victories and seasons, comes back to West after a successful stint at Northwest. Schartz had a terrific run at West from 1989-01, including a state runner-up showing in 1997. Arkansas City (3-3) – Arkansas City made the playoffs last season for the first time since 2003 with a 6-4 record. This year, the Bulldogs opened with three straight losses and then have won its last three contests by scores of 21-13, 13-12 and 30-19. Andover Central (2-4) – Andover Central started 1-2 but has lost three straight, including a 14-13 loss to rival Andover two weeks ago. In its four losses, the Jaguars have scored a combined 33 points. In its two victories, it has tallied 83 points. Key Games: (Week 7) Wichita West at Kapaun could decide both spots. Hays (5-1) – Opponents have outgained Hays High in five of six contests. On average, opponents have outgained HHS by 62 yards a game. However, the Indians are 5-0 when it either wins or ties the turnover battle. Hays High is plus-3 for the season and has some huge defensive plays, including a WAC-leading four interceptions from senior Clayton Riedel, a WaKeeney-Trego transfer. Junior quarterback Alex Delton has been hampered by a groin injury nearly all season and has thrown for 301 yards and rushed for 261 yards in four games. He has five rushing scores and three passing TDs against two interceptions. Senior running back Preston Weigel ranks second in the WAC with 784 yards. HHS will drop down to Class 4A, Division I. Great Bend (4-2) – Great Bend has the WAC’s No. 1 rushing offense with 1,506 yards and stands first in total defense at just 1,522 yards allowed. Running back Johnny Allende leads the Panthers with 629 yards, fourth-best in the conference. He has rushed for nine scores and Greg Burley has 302 yards and five TDs. Salina South (4-2) – After a big Week 1 victory against Derby, Salina South was considered Kansas’ top team. The Cougars have come back down some, but are still among the Class 5A favorites. Senior quarterback Justin Stonebraker has completed 53 of 80 passes for 922 yards and a 15/1 TD/INT ratio, while senior running back Mike Jones has 102 carries for 677 yards and 10 TDs. Salina Central (2-4) – Central opened 1-4, but has played the classification’s No. 6-hardest strength of schedule. The Mustangs have been competitive throughout the year, including a 42-31 loss at Hutchinson, a 49-35 defeat to Newton and a 34-28 loss to Maize. Senior running back Malik Veal has 87 carries for 570 yards and 10 scores. Key Games: For the fourth straight year, all games are key in what is annually a very strong district. Bishop Carroll (6-0) – Carroll, the defending Class 5A state champion, has won 19 straight contests, including the City League title with a win against Kapaun last week. Colton Howell has played well the last two games at quarterback, including 99 rushing yards and 66 passing and five TDs (three rushing) accounted for last Friday. Carroll ranks fourth in the classification in scoring offense and first in defense with a collective 225-53 score. 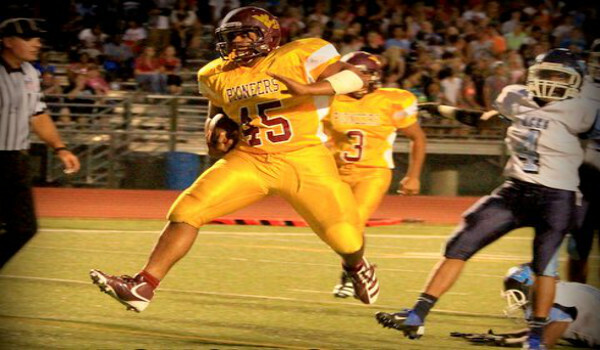 Liberal (3-3) – Liberal has enough offensive firepower to play with anyone in Kansas. However, the Redskins have had trouble defensively. Liberal stands second in 5A in offense (246 points), but sixth from the bottom in scoring defense (224) in the 32-team class. Senior quarterback Britton Abbott has completed 127 of 234 passes for 1,896 yards, rushed for 665 yards and accounted for 27 scores (14 passing). Wideout Trenton Hammond easily leads the WAC in all three receiving categories with 42 catches for 872 yards and 12 TDs. Goddard Eisenhower (2-4) – G-E has one of 5A’s top defenses at just 107 points allowed, ninth-best in the classification. However, the Tigers have scored 63 points, fourth-fewest. First-year coach Marc Marinelli, formerly at Hesston, has already doubled G-E’s win total from last season. Goddard (1-5) – Opponents have outscored Goddard 203-93. The Lions have averaged 187 rushing yards per game. Senior quarterback Tucker Vang leads Goddard with 479 passing yards and a 3/6 TD/INT ratio and 371 rushing yards.